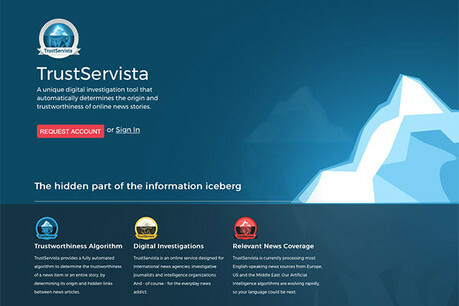 TrustServista is a tool that can help journalists find information sources and determine the trustworthiness of news. Romanian technology company Zetta Cloud started developing the tool after receiving funding in 2016 from Google's Digital News Initiative. Released in an alpha phase last month, TrustServista uses fully automated algorithms to analyse individual online news items or topic areas, monitoring their origin and any links to other articles. George Bara, co-founder of Zetta Cloud, said the tool processes the majority of English-speaking news sources from Europe, the US and the Middle East. The tool is currently being tested by selected users and journalists can request free access to an account, but Bara said it hasn't been decided yet whether TrustServista will remain free or if it will be offered as part of a subscription service in the future. "We realised the huge amount of time journalists spend reading content before they create their own content, but fake news can spread across multiple languages, publications and distribution channels," he told Journalism.co.uk. "To check where the origin of the misinformation comes from and how it propagates does require automation – it will help journalists significantly shorten their investigation time." Journalists can paste an article's URL into the application's main dashboard to find out the origin of the information within it, and who was the first to publish a piece of content on the subject. Text analytics then automatically check who the author is, if the article has strong positive or negative sentiment which could indicate subjectivity, and if it contains names, locations and facts or if it's just clickbait. "We want to add machine learning to it in the future, creating recipes based on statistics that make the algorithm much more reliable," he said. TrustServista also tries to find similarities and links between articles to highlight how news propagates, who references who, how information travels and who the source of the information is – ultimately deciding how trustworthy the story is. Users can also visualise this data and see, for example, how many articles were published per day, the topical relationships between them, the times they were published at in relation to each other, or the top newspapers that provided coverage on a given topic. The company is now in the process of trying to secure another round of funding from Google DNI, hoping to expand the tool to analyse a greater number of articles and include more advanced algorithms. "We collect RSS feeds at the moment, but our goal for the beta is to increase the number of articles we process per day to thousands rather than hundreds. "We also want to add social media such as Facebook or Twitter and other data sources that are not from traditional news outlets," Bara said.